I have been meaning to review Wheatfields, a bakery and restaurant one block West of Mass Street in downtown Lawrence, for quite some time, but this morning was the first time we actually had a meal there. I love a good, hearty breakfast, but because bacon, eggs, hash browns, biscuits and gravy are not as healthy as they are tasty, we normally only indulge on special occasions. With today being my birthday, we went for broke! Wheatfields makes the most wonderful breads and my wife has been buying them since she started working at KU nearly three years ago. Our favorite is the raisin and pecan sourdough ($, a robust torpedo-shaped loaf with a thick crust outside and plenty of raisins and pecan pieces inside. It toasts marvelously and is delicious alone, with butter, or coated in my favorite delicacy in the world ... peanut butter ... YUUUUUM! Baguette: The French standard. A crisp crust and an open, irregular crumb with lots of yeast fermentation flavor make ours a true classic. Great for sandwiches, crostini, or on its own. Ciabatta: As Italian as the baguette is French. Somewhat flat, somewhat rectangular, ciabatta has a wildly open crumb and a complex fermentation flavor. We add a touch of extra virgin olive oil. Country French: Our flagship Pain au Levain is naturally leavened and made with organic unbleached flour with stone ground wheat and rye. Kalamata Olive: WheatFields Sourdough, loaded with ripe Kalamata olives. Maggie Glezer (Artisan Baking Across America) calls ours “by far the best.” Available as either a regular boule or a “mini”: too big to be called a roll, too small for a loaf. Pain de Campagne is, literally, Country Bread, and is the traditional bread of the villagers and farmers of the French countryside. Historically, pain de Campagne had as much as 10% rye flour, was risen with levain and baked in a wood-fired oven. Ours is all of that, plus, we add some spelt (l'epautre) flour and season with sun-and-wind-dried Breton sea salt. 100% organic flour. Rustic Italian Round: Choose from our plain or rosemary loaves every day. Rustics are made of very wet dough that gets lots of fermentation time. The results are round crusty loaves rich in flavor with an irregular open crumb. Risen with bakers’ yeast and an overnight starter. Walnut Raisin: Thompson raisins and California walnuts in our naturally leavened Pain de Campagne dough. Toast it at breakfast, of course, but also try a soft goat cheese spread atop. 100% organic flour. Walnut Sage: Country French with walnuts and fresh sage. We serve our immensely popular “No. 9” sandwich on this bread. The sage and walnuts complement the turkey-cranberry pairing –our “everyday is Thanksgiving” bread. 100% Whole Wheat: The heartiest in our Pain au Levain series, this loaf is about as fundamental as bread can be: 100% organic wheat ground between natural granite millstones and baked on the hearth of a wood-fired oven. Made with a natural wheat levain 100% organic flour. Breads range in price from $4 to nearly $9 for their holiday specials, including chocolate cherry ($8) and anise and grape ($4) which are only made during the month of December. When dining at Wheatfields, you order at the counter immediately in front of you as you enter through the lefthand door (the bakery counter sits in front of the right), pay, and are given a small sign to place on your table so the servers can bring your order to the correct table. Drinks are help-yourself with three varieties of coffee (two regular and one decaf) and a small selection of fountain drinks. Our meals arrived rather quickly, even before I was done pouring our coffee and toasting the sourdough bread which accompanied my breakfast. 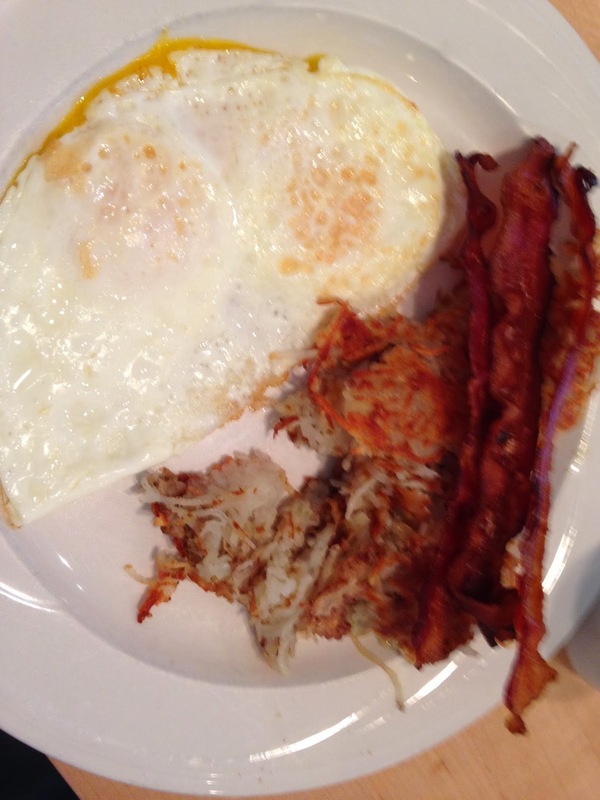 My Classic Breakfast was good with the eggs cooked perfectly over-medium, the bacon crispy but not burnt, and the hash browns also crunchy, just the way I like them. 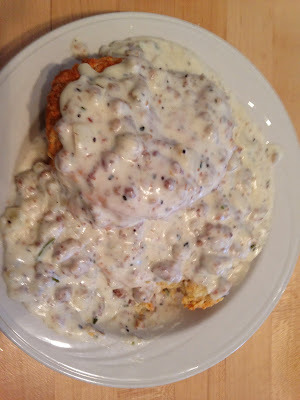 The order of biscuits and gravy was HUGE with two very large biscuits smothered in a thick country gravy with loads of sausage. I was surprised that my breakfast and the biscuits were luke-warm considering the fact that they arrived so quickly, leading me to believe that they are not cooked to order, but are prepared in advance, kept semi-warm, and served buffet-style from the kitchen. The taste was good, but my meal would have been better had it been served piping-hot. The coffee was hot, obviously fresh, and delicious! My wife's French toast consisted of three large slices of sourdough dipped in egg and fried with an overgenerous amount of cinnamon. At $6.95 for three slices of bread, a little egg, a dash of cinnamon, and a little (maybe Maple) syrup, this dish is overpriced by at least $1. Again, this dish could have also been warmer and it would have been nice if the accompanying cup of syrup had also been warm, but it seemed to be straight out of the jar (bottle or can). 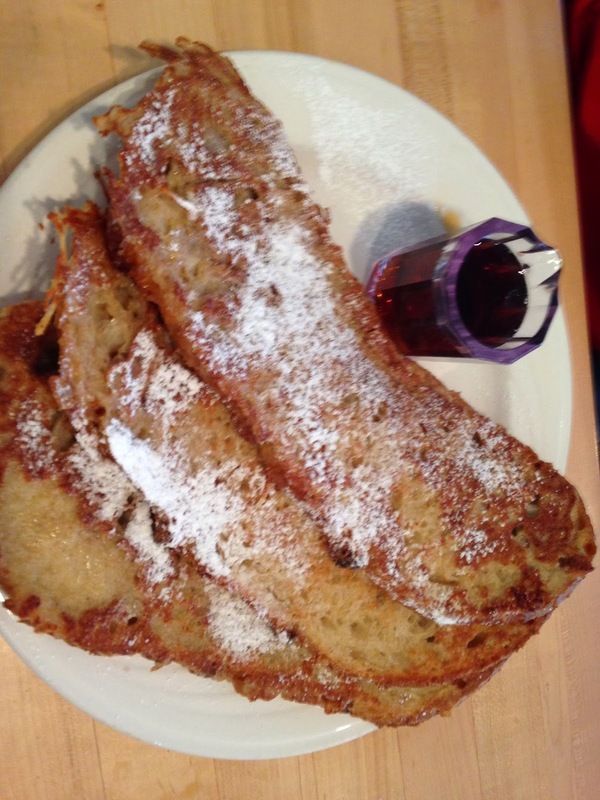 The cinnamon was overbearing, but otherwise the dish was good, not great. As breakfast goes, I have had better, much better, but we enjoyed our meal and may return for lunch or dinner to see how they do. Lawrence does not have an abundance of good restaurants, but being a fairly small town of around 90,000, I guess that is to be expected. Wheatfields is a very popular meeting place with great (not cheap) bread, excellent coffees, and "very average" breakfast fare. They seem to be doing well because the place was nearly full at 10:30AM on a Sunday, but I believe they would be bursting at the seams, as most GREAT breakfast restaurants do, if the food was cooked to order and hot. I would also suggest having the servers, who are already there to serve the food, take orders rather than creating a choke-point by having customers order at the counter and fiddle about with coffee, cream, sugar, drinks, silverware and napkins. The servers would likely also appreciate it, instead being tipped 15-20% instead of the loose change they receive in the jar by the register. A few smiles and an occasional "thank you" from staff would also be much appreciated. 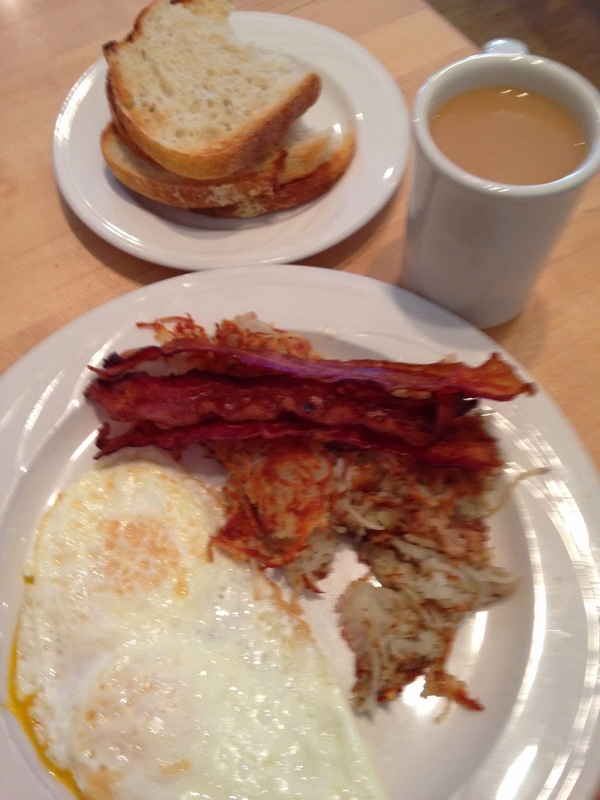 CombatCritic Gives Wheatfields Bakery Cafe 6 Out of 10 Bombs ... BOMBS ARE GOOD!